While the data used for the analyses outlined here are real, specific information about the company, as well as the proposed recommendations and final conclusions, are presented for illustrative purposes only. This case study demonstrates the utility of a number of spatial analysis methods including hot spot analysis, data clustering, defining drive time or distance areas, and attribute query. It also discusses several spatial analysis topics such as modeling supply versus demand, the small numbers problem, and boundary effects. The director of market research for a company that develops, designs, and manages resort-style retirement communities has been tasked with identifying candidate locations for a new facility. He knows he needs to be creative. While it may have been sufficient in the United States ten years ago to build sprawling developments in the warmest parts of the country, people approaching retirement today are not as willing to relocate. Many want to stay connected to friends and family, remain close to existing doctors, continue to work, to enjoy local cultural and educational opportunities, and to be surrounded by people of all ages. Consequently, as a first pass, he decides to look for locations projected to have large numbers of senior citizens but very few existing options for residential retirement. He will then narrow these locations by ranking how similar each candidate is to the company's current most successful resort retirement community. His workflow is summarized below. He will first model supply versus demand for retirement housing opportunities. 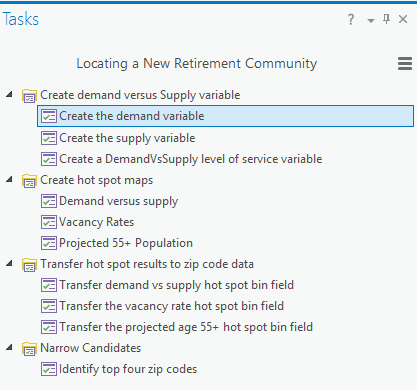 For the demand component of his model, he needs a variable representing potential retirement community residents. Since a new facility will not be open for a couple years, he obtains the projected 2019 age 55 and older population data, by ZIP Code, from Business Analyst. The supply component of the model proves a bit more difficult. Retirement facilities range from private homes accommodating one or two people to whole villages housing as many as 100,000 residents. While he can easily get the number of businesses within each ZIP Code that are classified as retirement communities, retirement homes, independent living facilities, or senior citizen housing (SIC codes 805904, 805918, and 836114), his business data does not include information about the number of residents or the number of residential units associated with each facility. 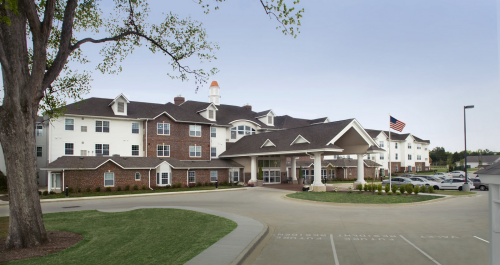 He decides to use the number of employees associated with these facilities as a surrogate for retirement community size, at least until better information is available. He also gets housing unit vacancy data from Business Analyst since locations with high vacancy rates generally reflect low demand for new housing. 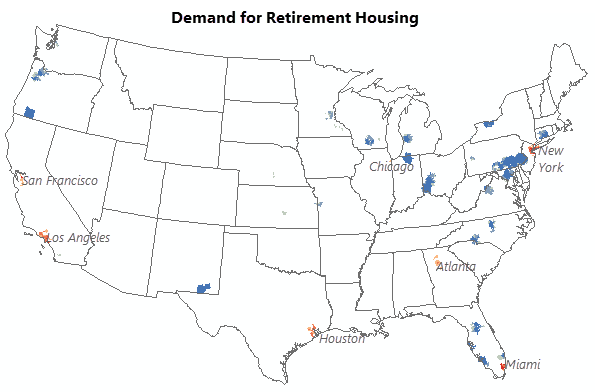 Where is the demand for retirement housing highest in relation to supply? Division by zero: For ZIP Codes without any retirement community facilities, the denominator will be zero and the ratio will be undefined. If these ZIP Codes are removed from the analysis as a workaround, it will eliminate most of the ZIP Codes in the contiguous United States (see the map below) and will likely remove the very high-demand locations the director of market research is hoping to discover. Small numbers problem: Extreme ratios due to small numerators and small denominators can also be a problem because they are unstable. The best example of this is mortality rates. Suppose you have a community with only two people and one dies from cancer. The cancer mortality rate for this community would be a very high 50 percent, an outlier that could throw off subsequent analyses. Similarly, a ZIP Code with very few senior citizens and very few retirement housing resources will result in ratios that are unstable. 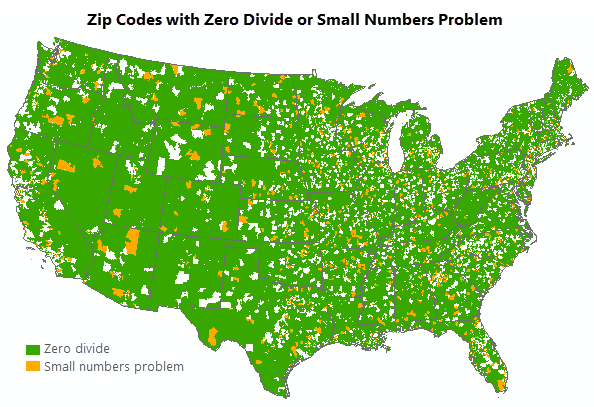 Most ZIP Codes would be impacted by zero divide or the small numbers problem. Boundaries: In addition, looking at a ZIP Code in isolation can be misleading. If a ZIP Code has lots of residential retirement opportunities and very few senior citizens, we might say it has more supply than demand. But what if it is surrounded by ZIP Codes with lots of senior citizens and no residential retirement opportunities? We will get a better picture of supply and demand if we evaluate each ZIP Code within the context of its neighboring ZIP Codes. 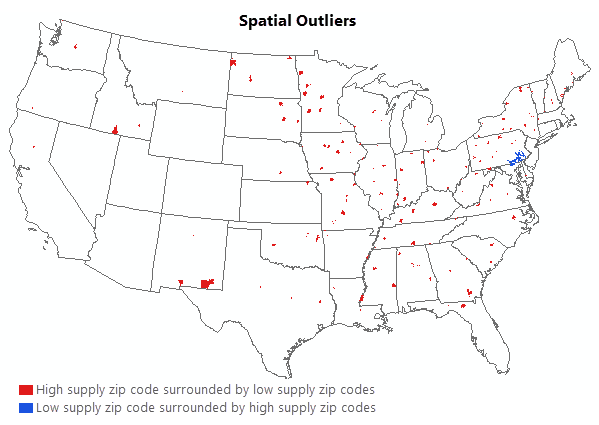 A number of high-supply ZIP Codes are surrounded by low-supply ZIP Codes. To address the division by zero and small numbers problems, the director of market research creates a level of service variable (L). The underlying assumption for the level of service variable is one of equity. If a ZIP Code contains 8 percent of the Country's projected 55+ population, it should also contain 8 percent of the Country's retirement community resources. The demand ratio is the projected age 55+ population in a ZIP Code, (di), divided by the projected age 55+ population in all ZIP Codes (D). Because the denominator is a count of all age 55 or older people in all ZIP Codes, it will never be zero or small (unstable). Similarly, the supply ratio, , is the estimated number of retirement community employees in a ZIP Code (ri), divided by the total number of retirement community employees in all ZIP Codes (R). Supply is equal to demand: When supply equals demand, L is zero. Suppose a ZIP Code contains 5 percent of the Country's senior citizens and 5 percent of the Country's retirement community employees. When you subtract the supply ratio from the demand ratio (5 - 5 = 0), the result is zero. Demand exceeds supply: When demand for retirement housing is larger than supply, L is a positive number. Suppose a ZIP Code contains 10 percent of the Country's senior citizen population but only 2 percent of the Country's residential retirement employees. When you subtract the supply ratio from the demand ratio (10 - 2 = 8), the result is a positive number. Supply exceeds demand: When the supply of retirement housing opportunities is larger than demand, on the other hand, L is a negative number. For example, if you have a ZIP Code containing 3 percent of all senior citizens but 12 percent of all residential retirement employees, the difference (3 - 12 = -9) is a negative number. To address the boundary issue, the director of market research uses Hot Spot Analysis on the level of service variable (L) which balances the surpluses or deficits within each ZIP Code with the surpluses and deficits for surrounding ZIP Codes. A spatial cluster of large positive values that is not balanced by nearby negative values will be identified as a hot spot for demand. Similarly, a spatial cluster of negative values that isn't balanced by nearby positive values will be identified as a cold spot for demand. The map below shows the results of this analysis. 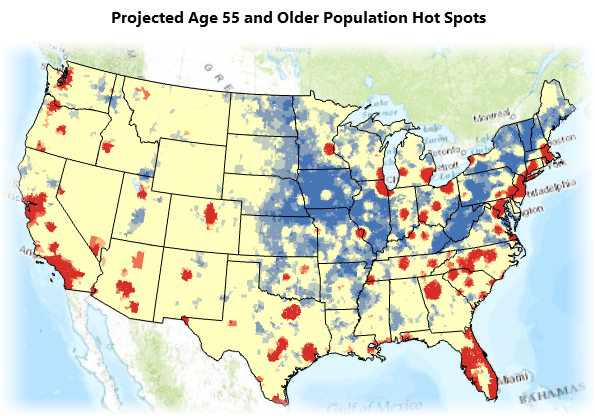 High-demand, undersupplied areas are shown in red; low-demand, oversupplied areas are shown in blue. Where are vacancy rates lowest? Which areas are projected to have the largest number of people age 55 and older? Next, the director will take into account vacancy rates (2014) and the projected (2019) number of people, age 55 and older, across the country. 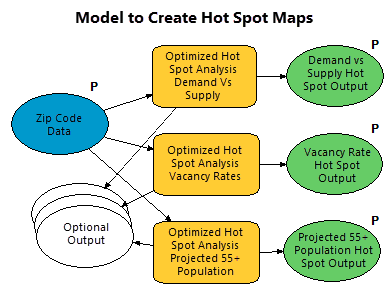 The hot spot analysis maps for these variables are shown below. The red areas have high housing unit vacancy rates. 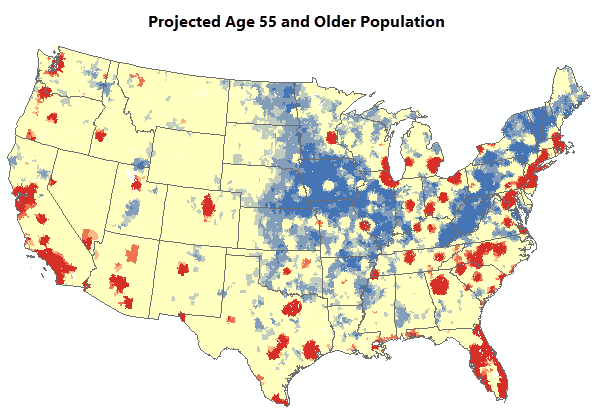 Red regions are projected to have the largest numbers of age 55 and older people in 2019. 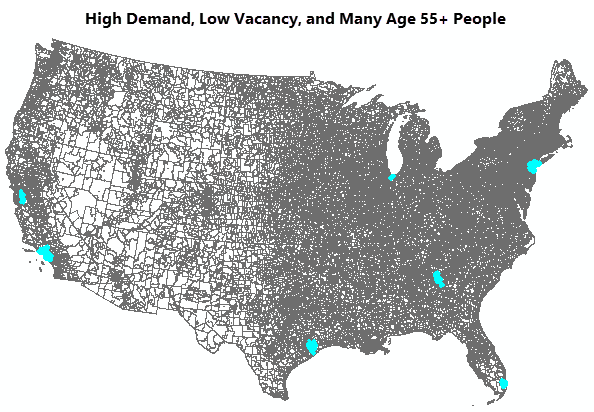 Where are vacancies lowest and demand for retirement housing highest? He finds that there are 898 ZIP Codes satisfying all three of these criteria. These become the candidate ZIP Codes for further analysis. Which of the candidate ZIP Codes most resemble the current best performing retirement community? 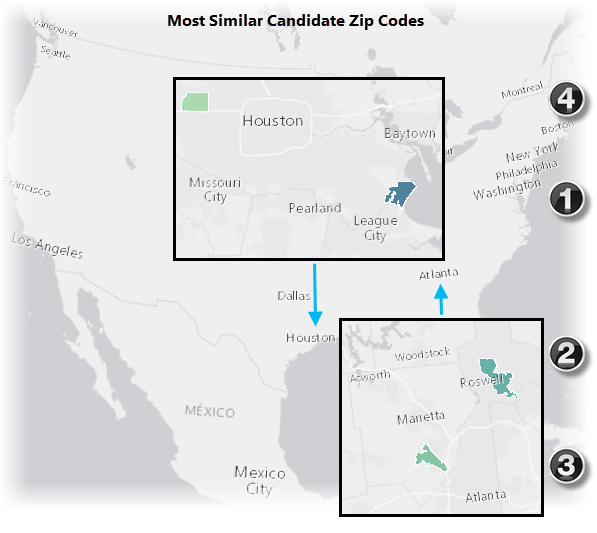 To narrow the list of candidate ZIP Codes further, the director will rank them by how similar they are to one of the company's current best performing communities. It is one their newest communities, actually, but has experienced the fastest lease-up time in company history. It also consistently maintains strong occupancy rates, and because it has some of the highest rents across the portfolio, it has been very profitable. The director will utilize tapestry variables to analyze the similarity of characteristics associated with each of the candidate ZIP Codes, to the characteristics for a 5-mile driving distance surrounding the best performing retirement community. What are tapestry variables? Business Analyst classifies United States residential neighborhoods into 68 unique segments based on their socioeconomic and demographic qualities such as age, income, home value, occupation, education, and consumer spending behaviors. Each of these 68 segments is a tapestry variable. Each tapestry variable has a name, and the names for the top four tapestries associated with the best performing retirement community are In Style, Professional Pride, Comfortable Empty Nesters, and Bright Young Professionals. The table below summarizes the characteristics for each of these tapestry categories. In addition to comparing the proportion of people in each of the top four tapestries, the director decides to include several other variables as well. Population density will provide some information about urban spatial structure. Including the family annual growth rate will add information about neighborhood character. Finally, adding an unemployment rate variable will tap into economic stability. With his final list of variables, he will rank all 898 candidate ZIP Codes by their similarity to the area surrounding the benchmark community, near Knoxville, Tennessee. The results of this analysis indicate that the top four, most similar ZIP Codes are concentrated in two locations: Houston and Atlanta. The rankings, one through four, are shown on the right side of the map below. What are these top ranking ZIP Codes like? Houston options: Two ZIP Codes in the Houston area were identified as having high demand, low vacancies, a large projected age 55+ population, and characteristics similar to the benchmark community. The first one is located southeast of Houston, along Galveston Bay. 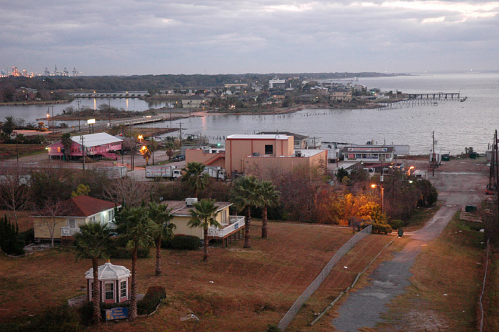 It encompasses several cities, including Taylor Lake Village, El Lago, and Seabrook. 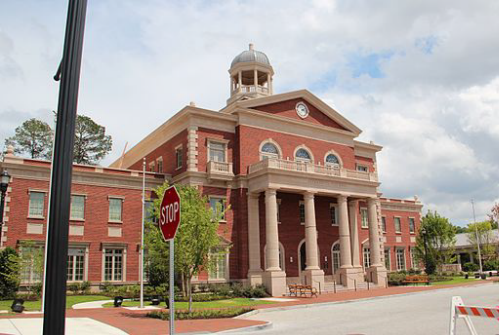 Taylor Lake Village prides itself on having the lowest crime rate in Harrison County and a spirit of good will. It is ranked number five in Texas for livability. 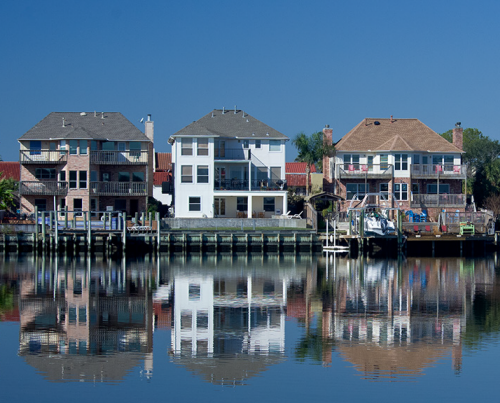 Seabrook is described as quaint, off the beaten path, and the area's best choice for saltwater living. This ZIP Code is near museums, shopping malls, fine restaurants, hiking trails, and the Johnson Space Center. Close to both Houston and the beaches of Galveston, this location offers residents many options for employment, education, recreation, and entertainment. The second Houston area ZIP Code is just northwest of the quiet and peaceful Memorial Villages. 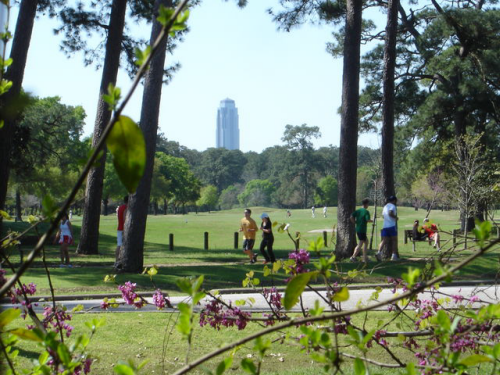 This area has great access to downtown Houston and the Houston Medical Center. 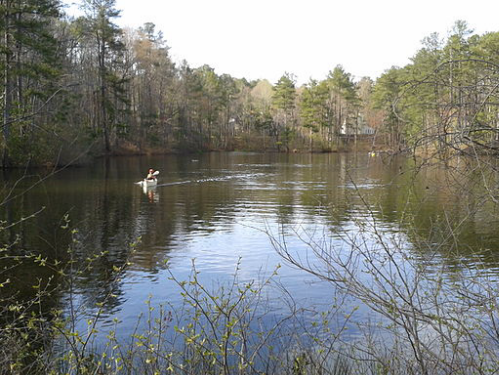 Located near a number of parks, it offers options for golf, hiking, and other outdoor recreation. This location also provides good access to shopping and fine dining. Atlanta options: In the Atlanta area, two ZIP Codes were identified as having high demand, low vacancies, a large projected age 55+ population, and characteristics similar to the benchmark retirement community. The first of these is located between the cities of Roswell and Alpharetta, just north of Atlanta. 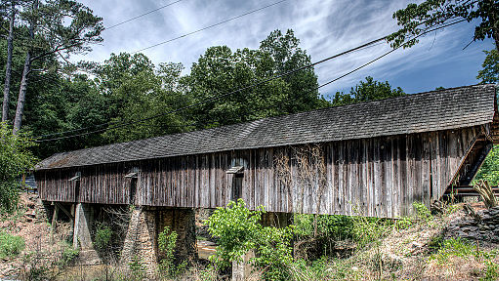 In 2009, Forbes Magazine named Alpharetta the number one place in America to move. 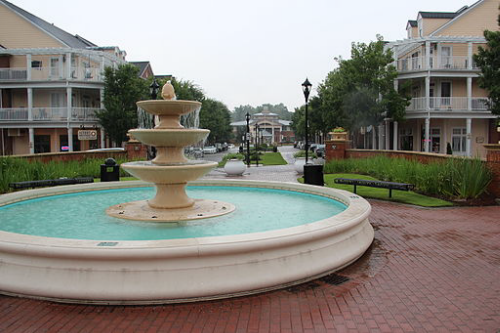 In 2012, they listed Alpharetta among America's friendliest towns. Both Alpharetta and Roswell appear in a list of the top 50 safest Georgia cities, and they also appear in a list of the top 10 cities in Georgia to live. Home to the Verizon Amphitheater, shopping centers, beautiful parks, and excellent schools, Alpharetta is called The Technology City of the South. Described as fun and vibrant, Roswell has gotten a lot of recognition, including being named a top city in the United States to retire. The second Atlanta area ZIP Code is located very close to the city of Smyrna, just 10 miles north of Atlanta. Smyrna is known as the jonquil city because of the thousands of jonquil daffodils that flourish all around the City each spring. It appears on the list of Georgia's safest cities and is considered one of the best places to live in Georgia. With walking trails, parks, stores, restaurants, and a number of special events throughout the year (concerts, festivals, and holiday activities), there is plenty to do here. The analysis identified some great locations. The director will next research potential acquisition properties in each of the ZIP Codes identified, and will present these, along with a full cost-benefit analysis, to the CEO and General Counsel. The steps below are based on ArcGIS 10.3.1 for Desktop, but should work fine for subsequent software releases as well. To follow the steps below, you may use the data in the data packages provided at the top of this case study, or you may improvise using your own data. Create the demand versus supply level of service variable. If you haven't done so already, download and unzip the data packages at the top of this case study. Open ArcMap. When it opens, use Catalog to navigate to the unzipped data and drag the layer package (ZipCodeAndTargetArea.lpk) into ArcMap. Once you have the data, you may complete the workflow by using the model tools in the workflowmodels.tbx toolbox, or by following the steps below (beginning with step 3). If you elect to use the model tools, run them in the order shown below. Also, be sure to create a folder for your output data and to modify the output paths each time you run one of the model tools. After you've run the final model tool, open the table associated with the top four ZIP Codes layer. Notice that the first record in the table is the best performing benchmark community, located near Knoxville, Tennessee. The next records in the table, in order from most to least similar, are the ranked candidates. 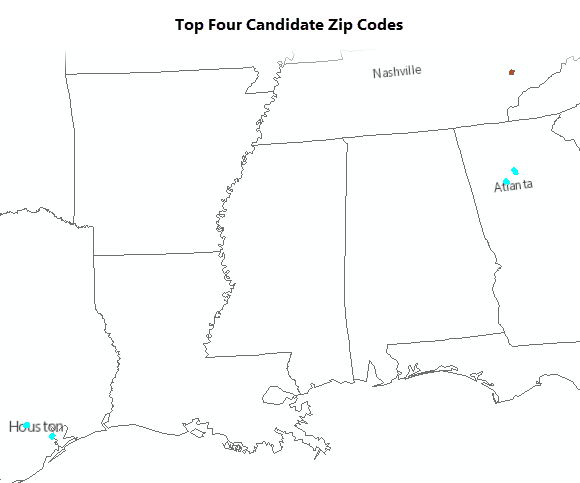 Click each record in the table to select the candidates one by one, confirming that two are located near Houston and two are located near Atlanta. If you want additional insight into each component of this analysis, you can repeat the workflow using the steps below. The first step in the analysis is to determine the total number of projected age 55 and older people, and the total number of retirement community employees in all of the ZIP Codes. Right-click on the Zip Code Data layer and select Open Attribute Table so you can see the variables you have available. You will begin by constructing a supply versus demand level of service variable. Demand will be based on the Projected 55+ Population variable. Right-click on the field header for that variable and select Statistics. A graphic showing basic statistics (mean, median, Standard Deviation, and so on) as well as a distribution of the values is displayed. Your supply variable will be based on the number of retirement community employees (Number of Employees field). Right-click on the field header for that variable and select Statistics. Highlight and copy the value for the Sum (428693) so you can use it to calculate the supply ratios below. Every time you run a tool, it is recorded in the Results pane. Double-clicking on a tool entry in the Results pane opens the dialog box with the parameters filled out. If you need to run a tool several times with slightly different parameters, it is usually quicker to access the tool from the Results pane and modify the parameters as needed. Create the level of service variable by subtracting the SupplyRatio from the DemandRatio. 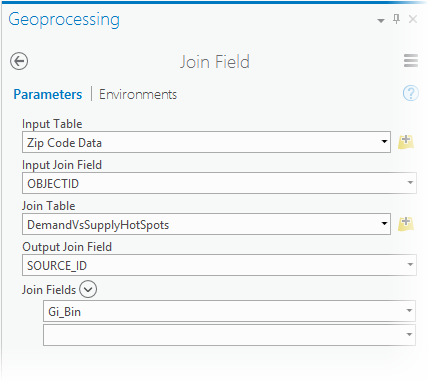 Similar to the steps above, begin by using Add Field to create a new field of type FLOAT called DemandVsSupply. 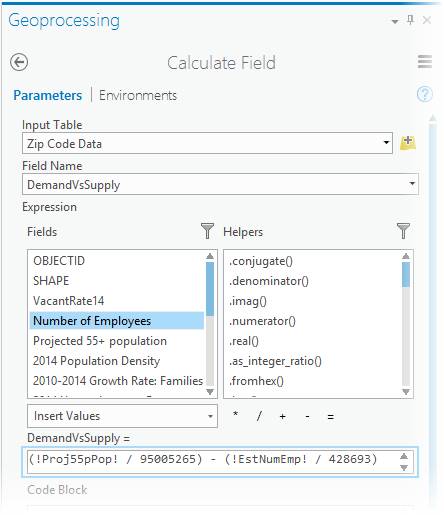 Once the new field exists, use the Calculate Field tool to compute the difference: DemandRatio - SupplyRatio for all of the ZIP Codes. 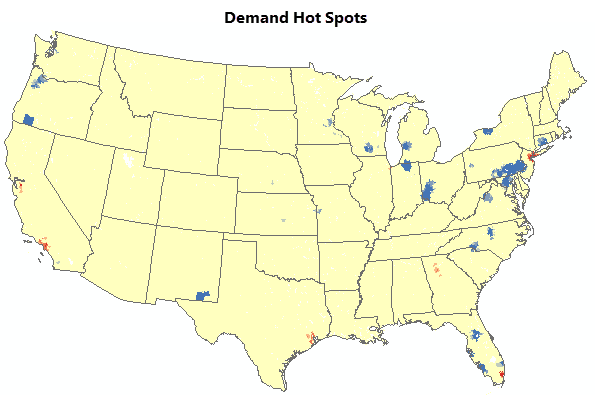 Create a hot spot map of demand for retirement housing opportunities. 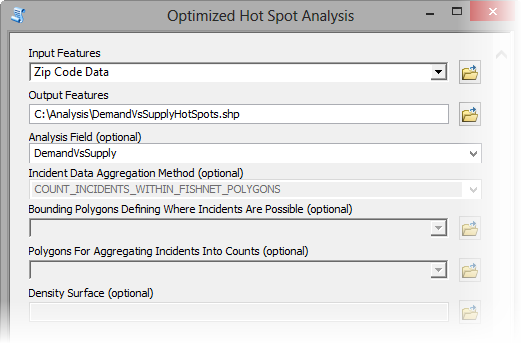 Find and open the Optimized Hot Spot Analysis tool. Set the parameters as follows and run the analysis. Add the U.S. States layer from <your ArcGIS Installation Folder>\DesktopXX\TemplateData, in TemplateData.gdb>USA>States. Clear the fill color for the States by clicking the square box below the states layer in the Table of Contents and setting the fill color to No Color. Remove the ZIP Code outlines by right-clicking on the hot spot result layer and selecting Properties. Click the Symbology tab. 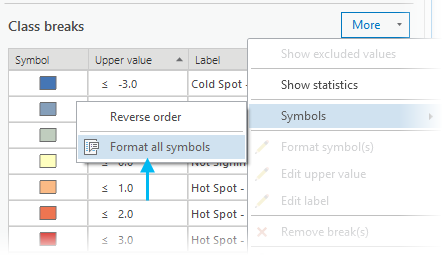 Click the Symbol column header and select Properties for All Symbols. Set the outline color to No Color and click OK to close the Layer Properties dialog box. Uncheck all but the demand versus supply hot spot layer and the U.S. States layer. Create hot spot maps for vacancy rates and the projected age 55 and above population. Move the U.S. States layer above the vacancy rate hot spot layer in the Table of Contents. 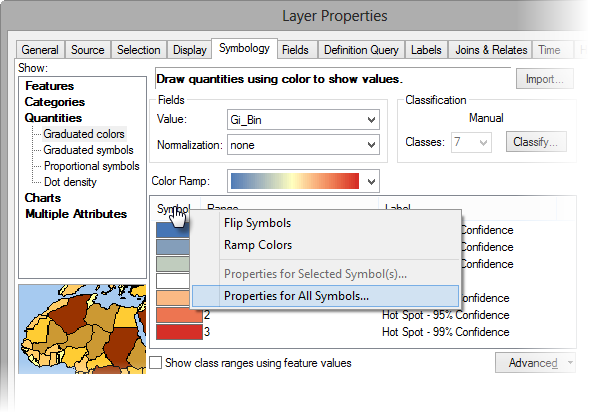 Remove the ZIP Code outlines as you did above for the first hot spot map you created: right-click the hot spot result layer, select Properties, select the Symbology tab, click the Symbols column header, and select Properties for All Symbols. Set the outline color to No Color and click OK to exit the Layer Properties dialog box. Move the U.S. States layer above the hot spot maps in the Table of Contents and remove the ZIP Code outlines as you did before. Transfer the hot spot result fields to the ZIP Code features. A hot spot is a statistically significant cluster of high values. Similarly, a cold spot is a statistically significant cluster of low values. The Optimized Hot Spot Analysis tool calculates a z-score and a bin field for each ZIP Code (for every feature in the Input Features). The bin value determines if the intensity of the clustering is statistically significant or not. The associated confidence level indicates how certain you can be that the observed clustering is real—that something other than random spatial processes are creating and promoting the statistically significant clustering you see in your data. You will use the bin values from each of your hot spot maps above in subsequent analyses, so in the next steps you will append those values to the Zip Code Data layer. 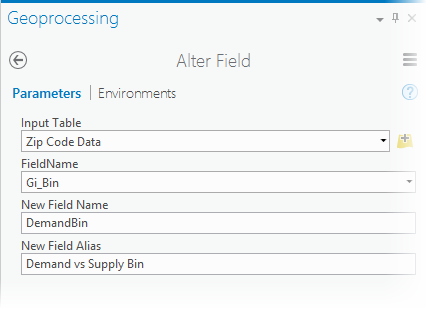 You will use the Join Field tool to bring the bin field over and then the Alter Field tool to change the bin field name. Repeat the steps three times, once for each of the hot spot results layers. This model encapsulates the steps above to transfer the hot spot analysis results fields. Select the ZIP Codes with low vacancy, high demand, and large projected age 55 plus populations. Find and open the Select Layer By Attribute tool. Notice that 898 ZIP Codes have been selected. These will be the candidate ZIP Codes for the final analyses. 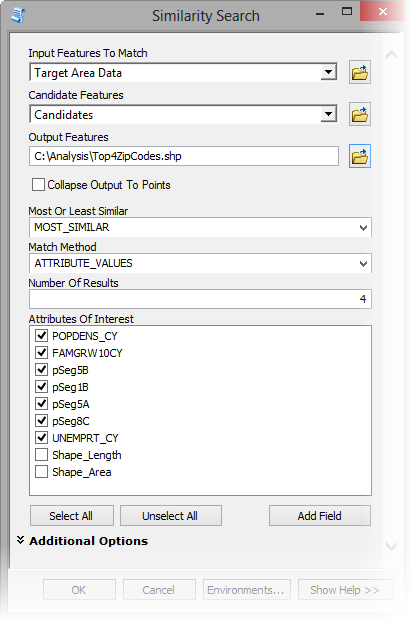 After the candidates layer is created, clear the selected ZIP Code features. There are several ways to clear selected features including clicking the Clear Selected Feature button on the Tools toolbar, or by running the Select Layer By Attribute tool and specifying CLEAR_SELECTION for the Selection Type. Narrow the candidate ZIP Codes down to only four best development options. All of the candidate ZIP Codes are associated with statistically significant high-demand, low-vacancy rates, and high-projected age 55+ populations. To find the best ZIP Codes to consider for future retirement community development, use the Similarity Search tool to rank these 898 candidates by how similar they are to the current best performing community. For this workflow, we have already identified the top tapestry variables for a 5-mile driving distance surrounding the best performing benchmark community. 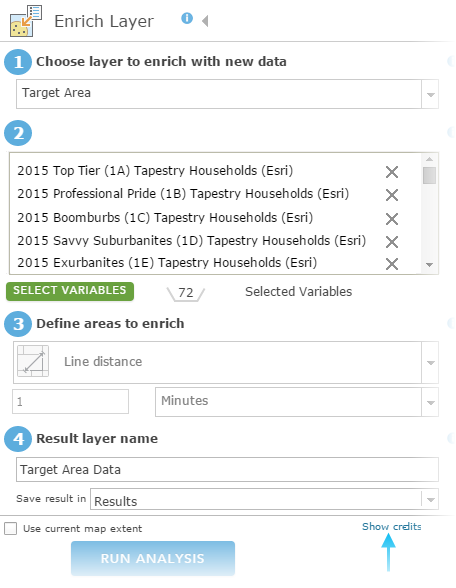 We did this by using the Enrich Layer tool in ArcGIS Online to obtain the count values for all 68 tapestry variables within the area surrounding the benchmark community. Looking at each tapestry, we determined which ones had the largest counts. The top four tapestries were In Style, Professional Pride, Comfortable Empty Nesters, and Bright Young Professionals. We created percentages for each of these tapestries by dividing the tapestry counts by the tapestry base variable. We also used the Enrich Layer tool to obtain population density, family annual growth rate, and unemployment data for the area surrounding the benchmark. Once we had this data for the benchmark community, we got this same data for the 898 candidate ZIP Codes. If you want to run through this analysis yourself, it is included in the ArcGIS Online workflow. 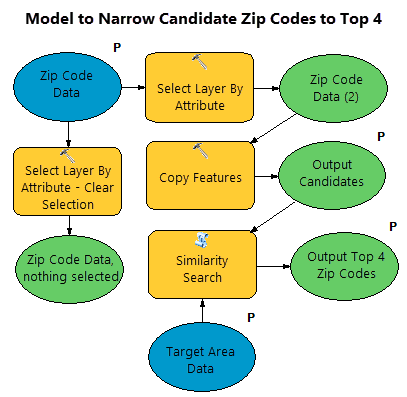 The 5-mile drive distance area, tapestry variables, and other key demographic data are in the Target Area Data layer included with the ZipCodeAndTargetArea.lpk layer package. Right-click the layer called Target Area Data and select Open Attribute Table. Notice the fields available for your analysis. If the table isn't already open, right-click the Zip Code Data layer and select Open Attribute Table. Notice that the same fields are available there. If one of your datasets is a shapefile and the other is a file geodatabase, you might see a warning about an alias name mismatch. You may ignore this warning. Open the table for the top four ZIP Codes result layer. Notice that the first record in the table is the best performing benchmark community, located near Knoxville, Tennessee. The next records in the table, in order from most to least similar, are the ranked candidates. Click each record to select the candidates one by one, confirming that two are located near Houston and two are located near Atlanta. Your analysis identified some great locations. You would next research potential acquisition properties in each of the ZIP Codes identified and prepare a report that includes a full cost benefit analysis for the stakeholders in your organization. The steps below are based on the 1.1 release of ArcGIS Pro, but they should work fine for subsequent software releases as well. To follow the steps below, use the data in the project package included with the data package at the top of this case study. The workflow can also be adapted to your own data. If you haven't done so already, download and unzip the data packages at the top of this case study. Open ArcGIS Pro and browse to the RetirementResortPKG.ppkx project package. If the Tasks pane isn't open or isn't populated, click the View tab and click Tasks. You can either follow the steps below, or run the shared analysis tasks, top to bottom, from the Tasks pane. If you choose to run the analyses using the tasks, first create a folder for your output results. As you run each task, be sure to write the output to your own local folder. 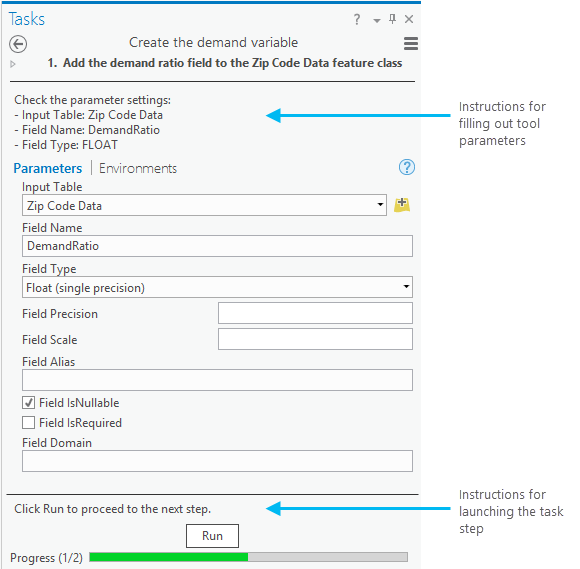 Double-click each task and fill out the parameters as instructed. Instructions for filing out the tool parameters can be found in the top of the Tasks pane. Instructions for launching each task step appear at the bottom of the Tasks pane. After completing the last task, turn off all but the Top4ZipCodes layer. Clicking through each record in the table for this layer will show you where these top four ZIP Codes for retirement community development are located. As an alternative to progressing through the shared tasks, you may follow the steps below to complete the workflow. The demand versus supply level of service variable has demand ratio and supply ratio components. To calculate these ratios, you will need to know the total number of projected age 55+ people and the total number of retirement facility employees in all ZIP Codes. Use the Summary Statistics tool to obtain these totals. 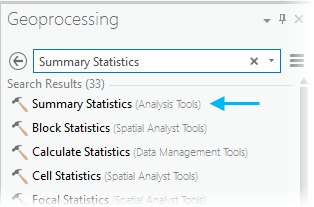 If the Geoprocessing pane isn't already open, click the Analysis tab and select the Tools (red toolbox) icon. 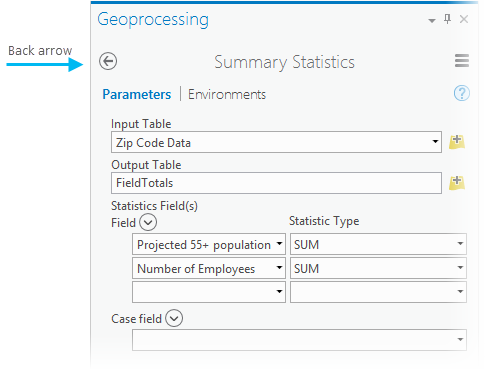 Use the search box at the top of the Geoprocessing pane to find and open the Summary Statistics tool. 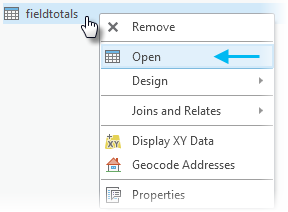 Use the back arrow on the tool UI to return to the search box after you run a geoprocessing tool. 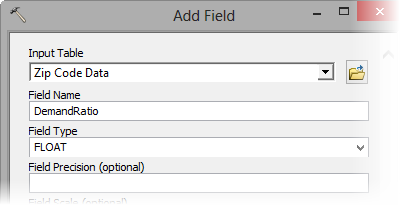 When the tool completes, you will see a new table called FieldTotals in your Contents. Right-click the table and select Open. 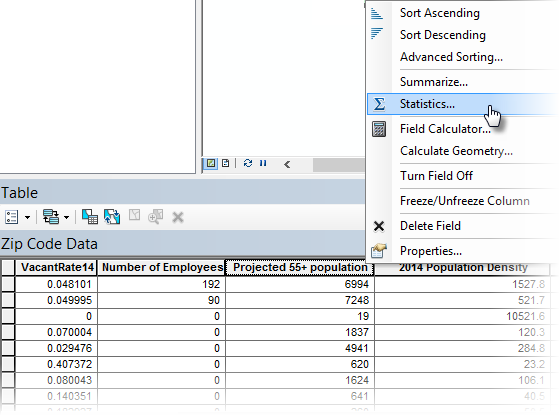 The totals for the projected age 55 and above population (SUM_PROJ55PPOP) and number of employees (SUM_ESTNUMEMP) are fields in the table. Write these values down (95005265 and 428693) so you can use them to calculate the ratios below. You will create three hot spot maps. 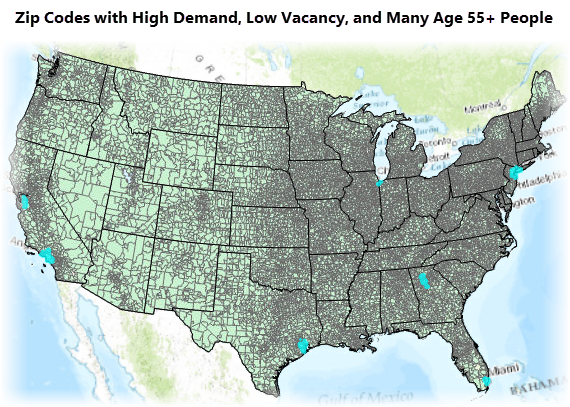 The first will show you locations with statistically significant clustering of high demand for retirement housing (the hot spots). 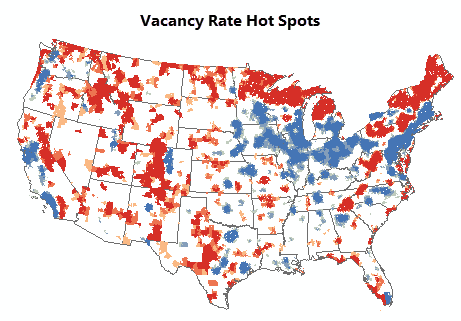 The second will show you where the lowest vacancy rates cluster spatially (the statistically significant cold spots). 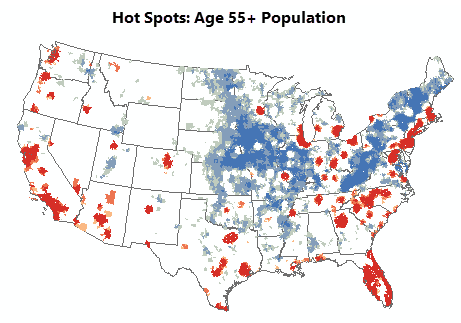 The last map will show you where large numbers of age 55 and older populations are projected to be in the next few years (the statistically significant hot spots). Find and select the Optimized Hot Spot Analysis tool. Check on the State layer and move it above the hot spot layer in the Contents pane. 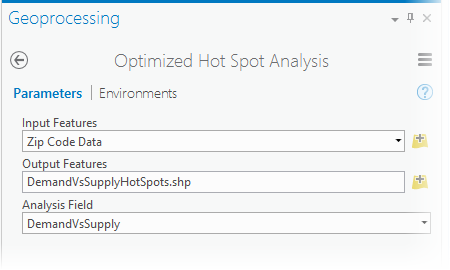 Right-click the DemandVsSupplyHotSpots layer and select Symbology. Click the More drop-down menu, select Symbols, and click Format all symbols. Click the Properties tab and set the Outline color to No Color. Click Apply. Uncheck all but the hot spot and states layers. Close the Symbology pane by clicking the x in the upper right corner. Move the States layer to the top of the Contents pane and clear the ZIP Code outlines, as you did above. Again, move the States layer to the top of the Contents pane and clear the ZIP Code outlines, as you did above. Select candidate ZIP Codes based on the hot spot analysis result fields. 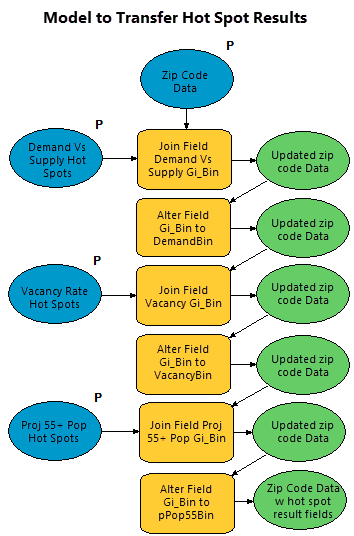 Use the bin values from each of your hot spot maps above in subsequent analyses, so in the next steps you will append those values to the Zip Code Data layer. 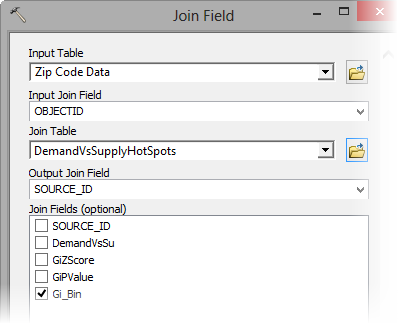 The Join Field tool allows you to copy the bin field from each hot spot map into the ZIP Code layer, and the Alter Field tool allows you to change the bin field name. You will repeat the steps three times, once for each of the hot spot results layers. Select the ZIP Codes with low vacancy, high demand, and large projected age 55 and older populations. 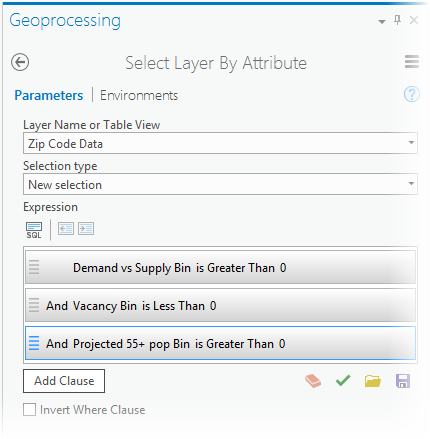 In the Geoprocessing pane, search for and select the Select Layer By Attribute tool. Narrow the candidate ZIP Codes down to the four best development options. All of the candidate ZIP Codes are associated with statistically significant high demand, low vacancy rates, and high projected age 55+ populations. To find the best ZIP Codes to consider for future retirement community development, use the Similarity Search tool to rank these 898 candidates by how similar they are to the current best performing community. 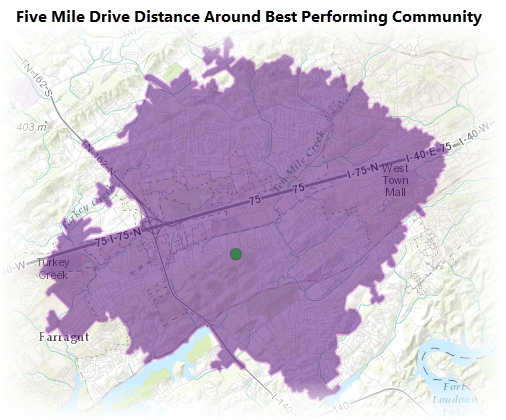 The 5-mile drive distance area, tapestry variables, and other key demographic data are in the Target Area Data layer included with the RetirementResortPKG.ppkx project package. Right-click the layer called Target Area Data in the Contents pane and select Attribute Table. Notice the fields available for your analysis. Right-click the Zip Code Data layer and select Attribute Table. Notice that the same fields are available there. Turn off all but the States and top four ZIP Codes layers. Move the States layer to the top of the Contents pane, if necessary. Right-click the top four ZIP Codes layer and select the Zoom To Layer option. Open the table for the top four ZIP Codes layer. (You may need to drag and resize the table to fit nicely at the bottom of the map.) Notice that the first record in the table is the best performing benchmark community, located near Knoxville, Tennessee. The next records in the table, in order from most to least similar, are the ranked candidates. 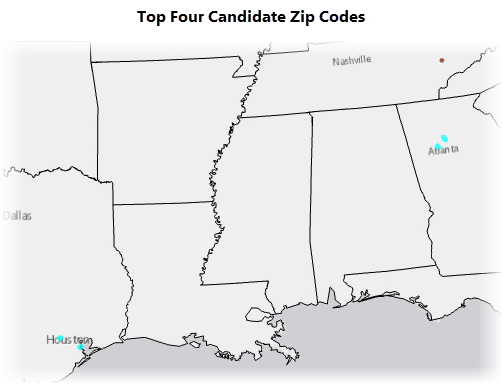 Click each record in the table to select the candidates one by one, confirming that two are located near Houston and two are located near Atlanta. If you want, try different Basemaps (or no Basemaps) to help you see the top four ZIP Code locations. The steps below are based on the July 2015 update of ArcGIS Online, but should work fine for subsequent software releases as well. Because the Enrich Layer tool always provides the most current data, your results may differ from those shown here. Consequently, the data used for the analysis when the case study was first created is included for you here. The instructions for getting the data by using the Enrich Layer tool are also provided; note that running the Enrich Layer tool will consume credits. An alternative to running the Enrich Layer tool is to read through those steps without actually executing the tool and using the Esri-hosted data provided to complete the workflow. You will need Administrator privileges in order to perform analysis with ArcGIS Online. Keep in mind that storing and analyzing data consumes credits. Get the data for your analysis. Search for LocatingRetirementCommunity. When it displays, select Add layer to new map. Hot spot analysis to identify these candidate ZIP Codes was done using ArcMap. If you want to run through this analysis yourself, it is included in both the ArcMap and ArcGIS Pro workflows. In the workflow below, you will be using ArcGIS Online to create a 5-mile drive distance around the best performing community and obtaining tapestry and demographic data for the area. You will then obtain the same data for the candidate ZIP Codes. Finally, you will use the Find Similar Locations tool to identify the top four high demand, low vacancy, large projected age 55+ population ZIP Codes that are most similar to the area surrounding the best performing community. Create a 5-mile drive time polygon around the best performing community. Click the Analysis button at the top of your map to open the Perform Analysis panel. Click Use Proximity and the Create Drive-Time Areas tool. Specify that you want to calculate drive-time areas around the TargetCommunity layer. Change the Measure parameter to Driving Distance and specify 5 Miles. Provide a name for your results, such as Target Area. To see how many credits will be consumed by this analysis, click Show Credits. Click Run Analysis. Determine the top tapestry segments. You will be looking for ZIP Codes that are similar to the area surrounding the best performing retirement community. 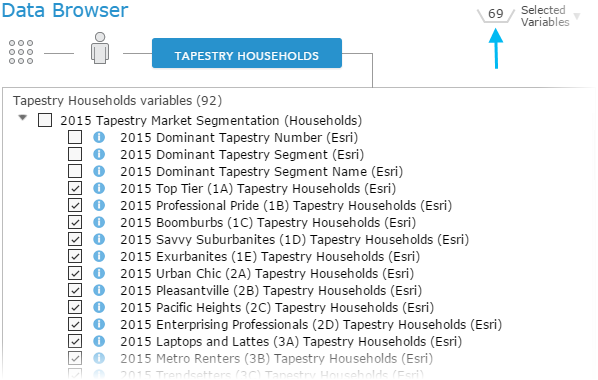 You will take advantage of tapestry variables because they summarize so many aspects of a population, such as age, income, home value, occupation, education, and consumer spending behaviors. To identify the top tapestries within the 5-mile drive distance area, you will obtain and compare all 68 tapestry segments. You will also obtain the tapestry base variable so you can calculate percentages. To minimize the number of credits you consume, you can skip this step. Read through each step completely, but don't execute the Enrich Layer tool. If you elect to skip the Enrich Layer tool steps, you can complete this workflow using the data provided with the Target Community and Candidates layers. If you do use the data obtained from running the Enrich Layer tool, that's great, but realize that your results may differ from the tutorial if your data is more current than the data that was used to create the tutorial. Click the Analysis button at the top of your map. Select Data Enrichment. Click the Enrich Layer tool. Set the first parameter: the layer you want to enrich with new data is the target area you just created. Click the Select Variables button to bring up the data browser. Scroll right and select the Tapestry category. Click the Tapestry Households button. If you expand the first entry, you will see the Tapestry Household variables, Tapestry LifeMode variables, and Tapestry Urbanization variables. Check the Tapestry Household variables. 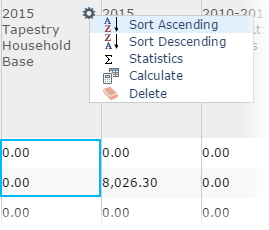 Expand the second entry and click the Base for Tapestry Segmentation Households variable. You should have a total of 69 variables selected. Click Apply. Open the Data Browser again (click on the Select Variables button) to obtain population density, family annual growth rate, and unemployment rate data for the target area as well. In the Data Browser search window, type Population Density. Expand the second drop-down menu and select the current year population density variable. Click Back. In the search window, type Families: Annual Growth Rate. Select the rate covering the current and previous years. Click Back. Finally, scroll left in the Data Browser and click the Jobs category. Select the current year unemployment rate variable. You should now have a total of 72 variables. Click Apply. Provide a result name, such as Target Area Data, and click on Show credits to see how many credits this tool will consume. Click Run Analysis. Hover over the target area data layer in the Contents pane to reveal layer operations available. Click the Show Table button to open the layer table. Convert the top four target area tapestry counts to percentages. Rather than counts, you will want to compare tapestry percentages between each candidate ZIP Code and the target area. Scroll all the way to the right in the table to see the new fields you added. Click in the field name on the gear symbol and select Calculate. 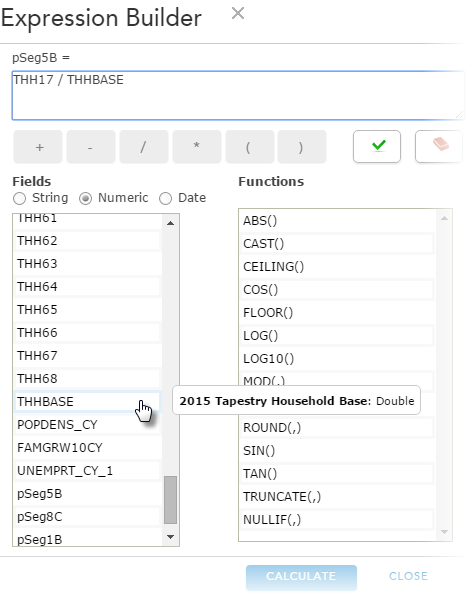 Create an expression that divides the count value by the base value, In Style (5B) Tapestry Households divided by Tapestry Household Base, for example. It is unfortunate that the variable names for the tapestry variables are so cryptic (hopefully, this has been corrected by the time you use this tutorial). If the variables appear in the Expression Builder as THHnn, you will need to hover over each field name in order to find the one you need for your expression. Close the Target Area Data table. Obtain the same data for the candidate ZIP Codes. To minimize credit usage, you may want to skip this step and use the data provided with the Esri-hosted data in your map. Click Data Enrichment. Click Enrich Layer to open the tool. Set the first parameter to the Candidates layer. This is the layer you want to enrich with new data. Provide a result layer name, such as Candidate Data, uncheck the Use current map extent box, click Show Credits to get an estimate of credit usage for this tool, and click Run Analysis. 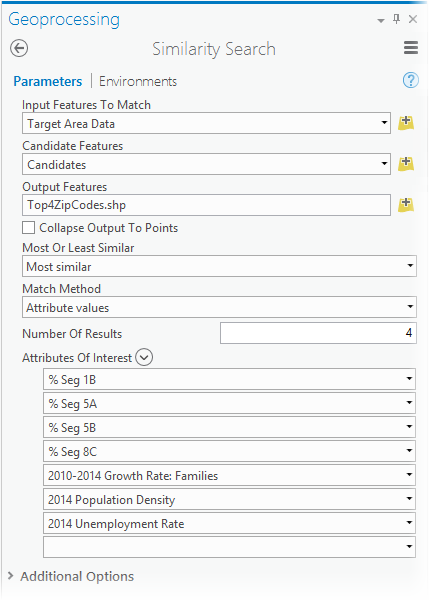 Create the tapestry variable percentages for the candidate ZIP Codes. Hover over the Candidate Data layer to reveal the available layer operations and select Show Table. Scroll all the way to the right in the table to see the new fields you added. Click the Tapestry Household Base field heading on the gear symbol and select Sort Ascending. Notice that some of the base counts are zero. If you try to create the percentages with these zero values, you will get a zero divide. Filter these zero (or very small) population ZIP Codes, excluding them from further analysis. Click one of the new percentage fields you created and select Calculate. Close the Candidate Data table. 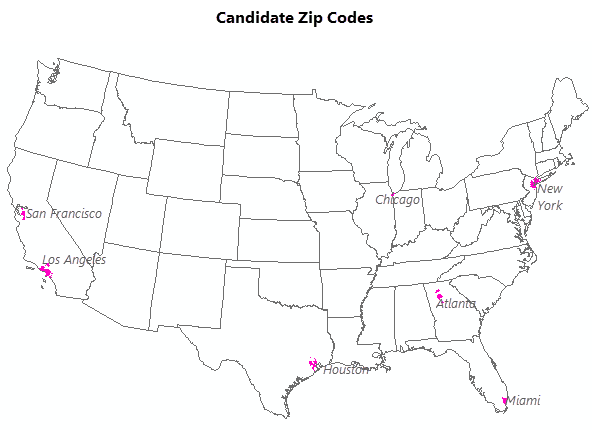 Rank the candidate ZIP Codes by their similarity to the target area. 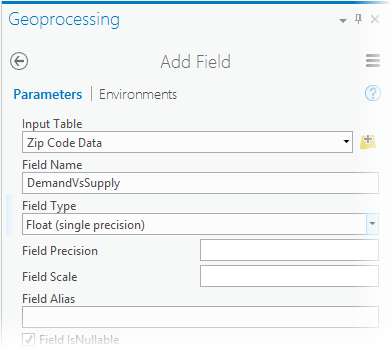 Hover over the Target Area Data layer to reveal the available layer operations. Click the Perform Analysis button. Click Find Locations and select the Find Similar Locations tool. 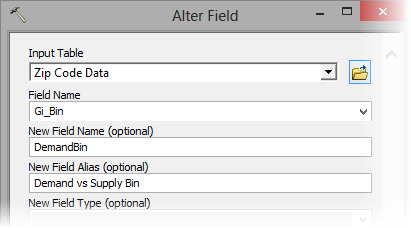 The first parameter should be the Target Area Data layer. Skip the second parameter. Indicate you want to search for similar locations in the Candidate Data layer. Base similarity on the top four tapestries, population density, family growth rate, and unemployment rate, by checking those variables. Indicate you are interested in the top four results. 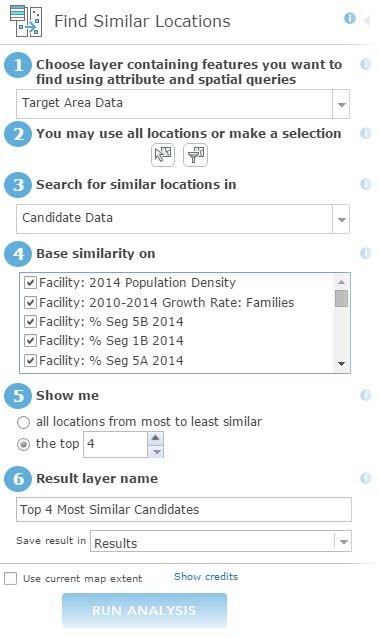 Select a name for the result, such as Top 4 Most Similar Candidates. Click Run Analysis. The graphic below shows the dialog box using the data that comes with the LocatingRetirementCommunity feature service. If you used the Enrich Layer tool to get the data, your fields will be a little bit different. Hover over the result layer to reveal the available layer operations. Click the More Options button and select Zoom to. Hover over the result layer again and select Show Table. The first record in the table is the best performing benchmark community, located near Knoxville, Tennessee. The next records in the table, in order from most to least similar, are the ranked candidates. Click each candidate record in the table, one by one, to see where they are located on the map. If you used the tapestry and other variables that came with the LocatingRetirementCommunity feature service, two of the top ZIP Codes will be located near Houston and two will be located near Atlanta. This case study demonstrates a number of analytical methods that can be adapted to many different application areas, allowing you to answer a variety of questions. Where do high and low values cluster together? Where are the statistically significant clusters of senior citizens, poverty, unemployment, wealth, beer drinkers, lead levels, or college graduates? Which features have the characteristics I'm interested in? Which features have more than 50,000 people and median annual incomes larger than $50,000? Which hospitals have readmission rates larger than 10 percent? Which features are most like my target feature? Which stores are similar to my best performing store? Which crimes in the database are most like the current one I want to solve? What are the dimensions, based on time or distance, of the area surrounding a location? What does a 5-mile or 5-minute walking, biking, or driving distance around the hospital look like? What can I visit within a 2KM walk from my hotel? In addition, you used data-enrichment capabilities to get tapestry and demographic data. A wide variety of data including demographics, consumer spending, occupation, and landscape data can be obtained for common administrative boundaries (for example, Census tracts or ZIP Codes), but also for any point, line, or polygon geometries. You used data manipulation and management functionality including Add Field, Calculate Field, Join Field, and Alter Field.